Those chants and more were shouted from coast to coast in 20 cities including D.C., New York, Los Angeles, New Haven, Chicago and Philadelphia where demonstrations organized by the Seize BP Campaign were held May 12, outside of BP offices. “The government must act now against BP. Bush and now Obama recklessly opened up these waters for offshore oil drilling without requiring the Oil Companies to provide adequate plans in the event of accidents, including catastrophic accidents such as occurred with the April 20 explosion on the Deepwater rig that left 11 workers dead,” stated Seize BP Campaign spokesperson Sarah Sloan. “BP executives are hedging and refusing to commit to pay for all damages caused by their reckless, greed-driven and criminal action, just as we predicted. BP shares none of its super-profits when its operations are going smoothly—why should others pay the costs when BP's recklessness makes things go awry,” Ms. Sloan emphasized. “Just how much BP pays should not be for its executives to decide. 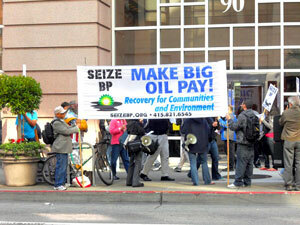 BP assets must be seized, and used to pay for cleanup costs and damages in full,” according to the organizers. The protests continue to focus the light on British Petroleum (BP), which is in the hot seat since the Gulf of Mexico oil spill which is threatening wildlife, the environment and the economy with no end in site as millions of gallons of oil continues to flood the Gulf waters. Harold Jameson was on his way home from work when he stopped and joined the protest. “People are up in arms because thousands of workers who have lost their jobs and livelihoods as a result of BP's actions have to wait in line to compete for lower wage and hazardous clean-up jobs from BP. BP's multi-millionaire executives are not asked to sacrifice one penny while working people have to plead for clean-up jobs.